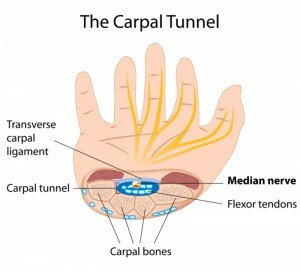 The word carpal refers to the hand, and the carpal tunnel is a hollow space that runs through the wrist containing multiple tendons that help to flex the wrist along with a few nerves. The largest nerve in the carpal tunnel is the median nerve, which maintains a significant sensory and motor function for the hand. There is a ligament overlying the carpal tunnel which is called the transverse carpal ligament. It is this ligament that places pressure on the carpal tunnel and causes the symptoms associated with the syndrome. Normally, there are nine flexor tendons and they all have a lubrication membrane that allows them to glide smoothly with wrist movement. When carpal tunnel syndrome is present, the tendons experience some swelling from the pressure and they do not glide as well with movement. In addition, the median nerve gets compressed and can result in pain, numbness, and decreased motor function. There are quite a few causes of the syndrome, with the most common being repetitive movements leading to inflammation. For individuals who work on a keyboard for a large part of the day, it is important that proper ergonomics are in place. Otherwise the syndrome is extremely common in keyboard workers. For carpal tunnel syndrome suffered from repetitive stress at work, it’s best to seek treatment from workers compensation doctors to obtain pain relief. Also individuals who paint a lot or garden a decent amount along with other occupations and hobbies with considerable wrist motion are at risk for the syndrome. Along with the repetitive movement causes, there are some medical conditions and hereditary factors that can contribute as well. There is a higher incidence of the syndrome in those with rheumatoid arthritis and diabetes. 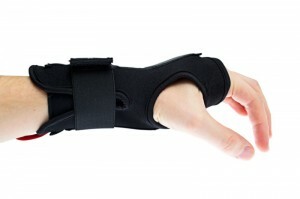 Pregnant women have a higher incidence of carpal tunnel syndrome due to the swelling in the wrist from water retention. Menopause, vitamin deficiency antithyroid or pituitary gland disorders also may lead to symptoms of carpal tunnel syndrome. Early on, people with carpal tunnel syndrome often have a slight burning or tingling in the hands and wrists. They might have early fatigue of the hand and over time this will develop into increased numbness, nerve pain and increased sensitivity to temperature. Range of motion might become affected as well, and people may have difficulty picking up and grasping various objects as well as they used to. If it is not treated, it may continue to progress and get to a point where constant pain is present and the pain is almost crippling. How is the syndrome diagnosed? Usually, the patient’s history is indicative of the problem. Along with this, physical examination which includes looking for a Tinel’s sign can help indicate the syndrome as well. One of the most commonly used diagnostic tests for finding carpal tunnel syndrome is a nerve conduction study along with an EMG. There is a false negative at times with these tests, so if they are negative the person may still have the problem. Imaging studies are not very helpful for the syndrome, but if there are red flags in the history such as night sweats and fevers, an MRI may help to look for something such as a tumor. Treating carpal tunnel syndrome nonoperatively is the best way to go. As a last resort, a carpal tunnel release can be performed. Bracing of the wrist can be very effective. Studies have shown that both extension and flexion of the wrist increase the pressure in the carpal tunnel. Therefore, having a wrist brace that keeps the patient in neutral can decrease that pressure along with symptoms of the syndrome. Ice may help along with stretching and mobility exercises. Capsaicin cream, also known as pepper cream, can help decrease the pain of carpal tunnel syndrome along with NSAIDs for swelling reduction. Chiropractic treatment along with acupuncture have some research to back up the treatment being used to decrease the symptoms. Placing cortisone into the carpal tunnel can also decrease pain and symptoms. These can be repeated every few months as necessary. One treatment that is underutilized includes proper ergonomics at home and at the office. This includes proper wrist rest for the computer and a better chair that has the ability to alter height so the wrist is not in an unusual position. Surgery for carpal tunnel syndrome is indicated as a last resort. Outcomes from the surgery have been reported to be 70 to 90% pain-free afterwards. The risks of surgery are small but real for the carpal tunnel release. These may include a small risk of infection, bleeding, and nerve injury. There’s also risk of ending up with RSD, which stands for reflex sympathetic dystrophy and results in considerable chronic pain. 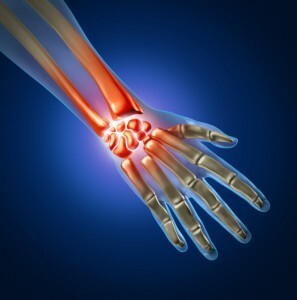 If you’re suffering from carpal tunnel syndrome or think you may be, let Arizona Injury Medical Associates help you.